Figure 1 - iXon Baseline Clamp (bias stability) in operation. A standard feature in iXons since 2002. EMCCDs are susceptible to various sources of data instability. Each of these sources have been addressed in iXon Ultra and iXon3 to ensure reliable quantitative performance throughout a kinetic acquisition and also repeatability between measurements. The baseline (or bias level) is an electronic offset added to the output signal from the EMCCD sensor to ensure that the displayed signal level is always a positive number of counts. No actual noise is associated with this positive counts value and thus it is important to recognise that it does not affect sensitivity. However one must remember to subtract the baseline offset value from the signal intensity when performing signal to noise calculations. Traditionally, when acquiring data, small changes in heat generation of the driving electronics within the detector head may cause some drift in the baseline level. This is often particularly observable during long kinetic series. Since 2002, Andor have been addressing this undesirable effect in our high-end EMCCD cameras. Any drift in the baseline level can be corrected by using our innovative Baseline Clamp option. Baseline Clamp corrects each individual image for any baseline drift by subtracting an average bias signal from each image pixel and then adding a fixed value to ensure that the displayed signal level is always a positive number of counts. As such, the baseline remains at a rock-steady value during a fast kinetic series, as shown in Figure 1. Note: The baseline bias level is also susceptible to variation at different EM gain settings. Again the iXon baseline clamp corrects for this, ensuring the bias level is clamped no matter what EM gain setting is selected. 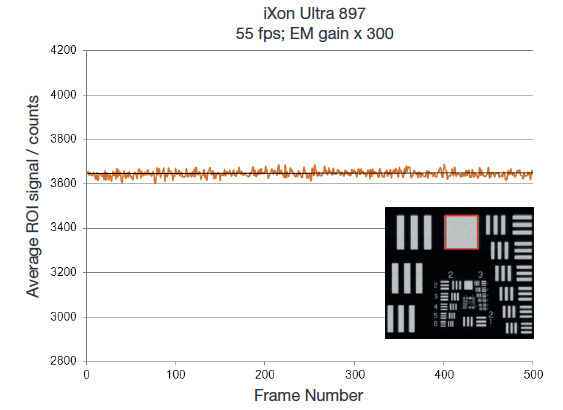 Figure 2 - EM gain stability in the back-illuminated iXon Ultra 897 (512 x 512 pixels) – LED measurement. It is a well recognized fact that EM multiplication factor is temperature dependent. That is why iXon pioneering RealGainTM – a linear and quantitative EM gain calibration - is temperature compensated, i.e. the same precise correlation between software EM gain selection and actual EM gain holds at whatever cooling temperature is selected. This will be addressed in more detail later. However, another by-product of this temperature dependence is that we must also pay close attention to optimized temperature stability regulation. The iXon Ultra maintains a thermostatic precision of +/- 0.01°C. The results of such attention to detail are best understood through observation of the stability via measurement of a stable light source, as shown in Figure 2. Here we used the back-illuminated iXon Ultra 897 to measure signal from a stable LED source overlayed with a resolution chart, imaged in conditions of zero ambient background light (use of a light-tight darkbox). Kinetic series were recorded over 500 frames @ 55 fps (17.8 ms exposure time), frame transfer mode, Baseline Clamp activated (such that absolute bias stability is in place also). A moderately intense signal, such that instability would not be lost in the signal shot noise, was recorded with x300 EM Gain. A Region of Interest kinetic plot was derived from the data, as shown in Figure 2. Significantly, there is no additional relative signal variation observable over the duration of the kinetic series. When performing stability measurements, care must be taken to assess the stability of the light source. As an example, an iXon 897 was mounted on a research grade widefield epifluorescence microscope and fixed cells, immuno-stained with fluorescence dyes (Invitrogen Molecular Probes), were imaged over a similar kinetic series, as shown in Figure 3. Figure 3 - Instability of the light source on a standard research grade epifluorescence microscope. In these experiments the variation of the signal intensity was significant, whether EM gain was on or off; the amplitude of variation was much higher than the shot noise on the signal. This indicates that the light source of the microscope itself can often be subject to much greater stability variations than could be derived from any EM gain instability observations. One needs to very carefully check for all sources of undesirable signal fluctuation, such as stability of illumination (background illumination fluctuations can also contribute) when conducting quantitative time course experiments.